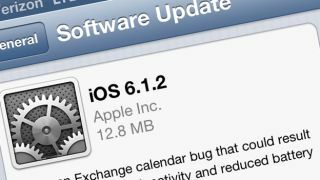 Apple launched the iOS 6.1.2 software update today in order to resolve a battery drain issue experienced by those using a Microsoft Exchange calendar with the device. The modest bump, which also fixes the 'increased network activity' caused by the bug, was made available to iPhone, iPad and iPod touch users Tuesday afternoon. The documentation accompanying the update on Apple's support site simply says iOS 6.1.2 "fixes an Exchange calendar bug that could result in increased network activity and reduced battery drain." The tiny 12.8MB update can be downloaded over-the-air by entering the Settings menu and selecting Software Update. However, users must be logged onto a Wi-Fi network. However, it does not appear that the update has addressed the passcode vulnerability, which made it possible for the 4-digit code added to iOS devices to keep out prying eyes to be by-passed. The weakness, exploited through a complex sequence of button pushes gave access to an iPhone's call log, while also allowed the intruder to view photos, modify contacts and more. After admitting that it was working on a fix last week, Apple was expected to kill the flaw with this update, but tests on devices with iOS 6.1.2 already installed suggest that it is yet to be addressed. It also appears that the "Evasi0n" Jailbreak method posted last week has not been closed off at this point. For the jailbreak happy out there, a member of the group of developers that issued the popular iOS 6.1 "evasi0n" jailbreak took to Twitter to announce that an updated version compatible with the newest OS iteration will be available sometime today. That team works fast.